magazine with a glossy cover. Twenty four years may seem like a long time, but when you are having fun and you do what you love, the time goes very quickly. That is exactly the case for us at Desh-Videsh Media Group. 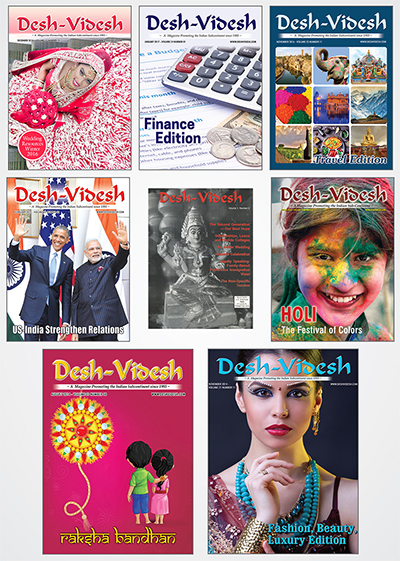 This year, 2017, will mark 24 years that Desh-Videsh has been in print – what exciting and fun-loving journey. 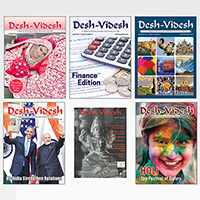 Some of you have witnessed Desh-Videsh grow from a 24-page black and white magazine to a 148-page full color magazine with a glossy cover. We wish a big thanks to all of you – our readers, advertisers, friends, and family members. 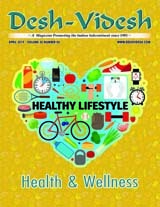 In 1993, Desh-Videsh began with a simple idea. Since then, the magazine has advanced from a modest compilation of submitted articles (any and all we could get!) to an award-winning publication that attracts well-known writers and focuses on issues of great importance to the South Asian Community. Many things have been said, written and preached about Gandhi ji. It is never enough for a half-naked fakir who lived life by his own principle and died because of his noble principle. In 2001, Desh-Videsh along with many in the media, including the BBC, proclaimed Gandhiji as Man of the Century. Desh-Videsh even published a special edition on Gandhiji. In 2012, the magazine held its first ever Gandhi essay competition and published a revised special edition on Gandhiji. When former president of India Abdul Kalam unveiled the Gandhi Statue in South Florida, Desh-Videsh provided extensive coverage of the momentous event. We were also very proud to cover Arun Gandhi, grandson of Gandhi ji, visit to South Florida for a peace conference. Indian children who live in the United States and excel in a wide range of fields have always been a major focus of Desh-Videsh over the years. From spelling bee competitions, math competitions, and a record number of Indian students earning the title Valedictorian, Desh-Videsh has been very proud to cover each of them. Desh Videsh Media Group’s tag line states “Promoting the Indian Subcontinent since 1993.” For us, it is not just a tag line, we live and breathe it. When it comes to Indian festivals, be it Diwali, Holi, or Ramadan, we use the magazine as a platform to engage and educate our children about these cultural events. Weddings are a very important part of South Asian culture, not only for the celebrations, but also for the rituals and traditions. 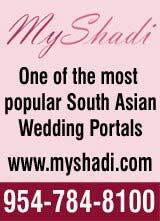 With four special wedding resource editions a year, six MyShadi Bridal expos a year and the myshadi.com wedding portal, Desh Videsh Media Group has been at the forefront. 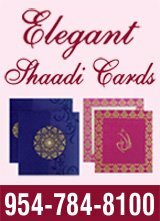 We use these platforms to expose our customs and rituals not only for the benefit of our own community, but also for the American community at-large.Many of you witnessed and supported the first MyShadi Bridal Expo in 2009. With your support we have grown from an expo featuring 40 booths, to one with over 140 booths and one show per year to six shows per year. What an exciting journey! Each year, Desh Videsh Media Group and MyShadi Bridal expo host bridal expos in Georgia, Carolinas and Florida, giving couples and their families an opportunity to meet with a variety of vendors in one afternoon and reduce some of the stress associated with wedding or event planning. Instead of spending several weekends meeting with a long list of vendors, couples and their families can narrow their choices to their favorites or even finalize their selection. For those in the throes of wedding planning, being able to switch focus to a select few preferred vendors is truly an achievement. With multiple events and a large guest list, the possibilities to truly flaunt your personality and feed your creative side are endless. The MyShadi Bridal Expos fuel that desire giving couples and their families a firsthand look at the latest trends in event and wedding planning. One of the highlights of each MyShadi Bridal Expo is the designer fashion shows. Models strut down the runway showing off gorgeous, modern saris and intricately designed lenghas from some of the region’s exclusive and well-known clothing and jewelry boutiques. Some clothing and jewelry vendors join the Expo from as far as London and India, so attendees really do get a look at the latest styles and fashions. Though it has been 24 years, we have only just begun. The important task of fostering community harmony and strengthening our ties remains. Our staff never tires of finding ways to connect with customers and subscribers and determining their needs while also workingconstantly to improve our service value. So, again, we thank you for your part in making this progress possible. We hope to have the privilege of serving each of you for many years to come.In spite of all progress, we remain imperfect. We value your feedback, even when you tell us about our goofs! Such feedback enables us to correct and improve. We also value the opportunity to serve you-our mantra is to focus on assisting each customer and each reader, one at a time – cheerfully and professionally. As always, happy reading!